Accounting and finance professionals are crucial to driving strategy and future business growth. But decision makers at many midsize and large companies aren’t fully leveraging this talent. In a recent BlackLine survey conducted by Censuswide (http://bit.ly/2fA0n1Y), 52% of business decision makers from companies with at least $250 million in revenue agreed that their finance teams can be entrepreneurial in the way they help the business grow. Nearly half (45%) identified a strong understanding of future finance needs as the most important skill required to develop the business. 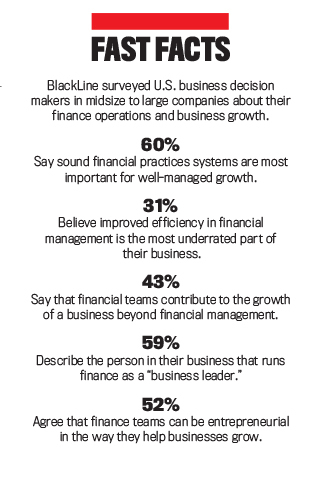 Yet 31% revealed that their companies vastly underrate improvements in financial management efficiency. 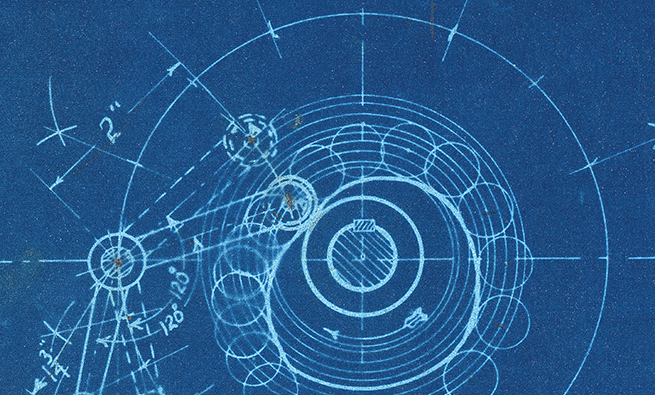 Manual processes have no place in the future of finance. These tedious tasks take up too much time and lead to an uneven workload, long hours, and escalating frustration. But automation alone won’t transform your finance organization. Outdated accounting operations in the form of the traditional record-to-report (R2R) process risk damaging the quality, accuracy, and timeliness of results. Each line on the balance sheet is made up of thousands of underlying transactions, often manually compiled and adjusted by overworked accountants facing pressing deadlines. This is an error-prone process that puts incredible amounts of strain on employees, stifling productivity, scalability, and visibility (see Figure 1). The R2R model condenses a huge amount of work into a short span of time and delays data processing and reporting to the end of the period. By leaving so much work to get done in just a week or so, accounting and finance teams face costly challenges. There’s mounting pressure to increase transparency in financial reporting, and spreadsheets can’t provide this kind of visibility. With no central database, there’s a lack of control, and the inevitable inconsistencies that arise can hamper big-picture strategy and decision making. This, in turn, can have a profoundly negative impact on the organization. 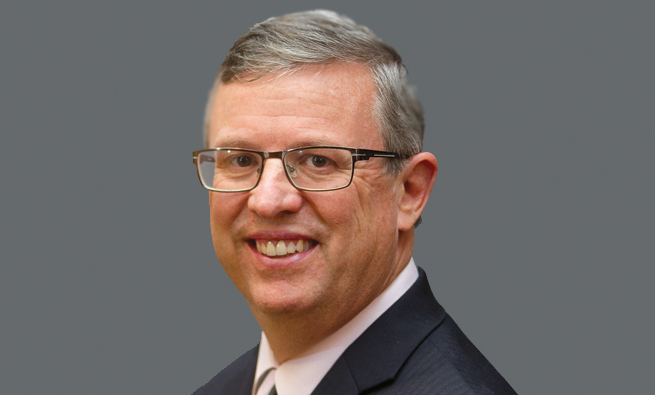 Coupling this with legacy technology can make everything about accounting and finance feel outmoded, which in turn dulls motivation and causes department-wide dissatisfaction that can lead to increased turnover rates. When nothing about their job actually uses their well-honed skills in analysis, accountants can feel blocked from helping their business think more strategically. To unlock the value of your accountants, you need to automate the tedious, manual accounting work that consumes so much of their time and effort. An automated process that’s repeatable, organized, and transparent reduces your exposure to risk and provides confidence in the reporting outcomes. The resulting efficiency and effectiveness free up your accountants to focus on analysis and input, which is the reason they pursued this profession in the first place. If done properly, this can lead to your accountants loving their jobs again, and the increased level of retention and strategic insight will be reflected in your bottom line. The most successful process evolution projects start at the bottom. When processes are broken down into smaller and smaller components, opportunities for continued automation and optimization surface organically. Many of the processes that are the easiest to improve and automate are also often the most manual and risky. These can include complex logic-based journals, variance analysis, and open items clearing. See Table 1 for a short list of processes that likely are ready for automation. As an example, let’s look at the process of reconciling a credit card’s receivables account. Organizations in the early stages of automation likely complete reconciliations on spreadsheets, print them out, and store them in a binder somewhere. An obvious first step to improvement here would be to adopt software for account reconciliations. This helps streamline and control the process, but correcting journal entries are still manually created in the enterprise resource planning (ERP) system and then attached to support the reconciled balance. The next step to improving this process is to then centralize journal-entry creation and posting to ensure that correcting entries are always tied to the associated reconciliation. This embeds consistency and control into the creation of journals while providing instant visibility into all reconciling items. In the case of credit card receivables, however, the thousands of transactions behind that account require manual ticking-and-tying, a frightful process full of rainbow spreadsheets, macros, and confusion. Once an organization begins modernizing its R2R process by centralizing account reconciliations and journals, automated transaction matching adds further streamlining to create a comprehensive, end-to-end process. Transaction matching can create and then post journal entries, send reconciling items to account reconciliations, and flag exceptions for human investigation. With transaction matching, automated journals, and account reconciliations, even historically resource-intensive processes like reconciling credit card receivables accounts can be run automatically and continuously, leaving the accounting team to have to deal only with exception handling. Once this process is automated and optimized, imagine extrapolating these results across all reconciliations, journal entries, and matching opportunities. This bottom-up approach allows organizations to methodically and continuously improve over time. The entire business realizes unprecedented agility, intelligent analysis, and data-driven decisions as new technology is adopted, processes are improved, and people are empowered. 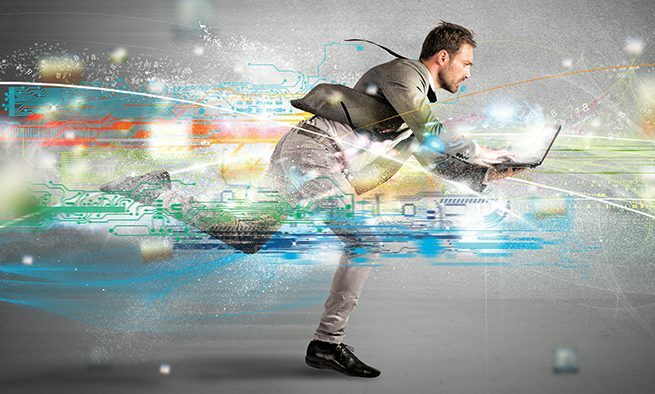 Are you ready to move forward into the future of finance? Here are three powerful approaches for utilizing finance automation to truly transform the way accounting and finance work at your organization. Together, they can help you begin to attract talent rather than be responsible for burnout. One area where many companies are applying finance automation effectively is period-end accounting. 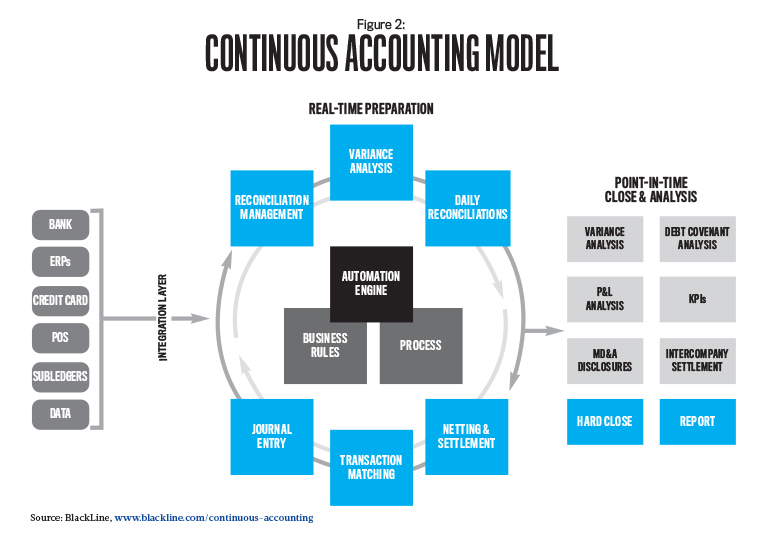 As automation is implemented to accelerate financial close processes, companies can move effectively toward a Continuous Accounting model where automation, control, and period-end tasks are embedded within day-to-day activities (see Figure 2). This more closely aligns the rigid accounting calendar with the broader business and frees skilled accountants to spend more time on research and analysis, driving value for the entire business. This combination of process change and technology adoption results in a more efficient close, more timely and accurate financial data, and a more effective organization. One large casino applied this approach to its accounting operations and experienced immediate and quantifiable benefits. The company had already implemented process changes, reviewing the transactions of each point-of-sale (POS) system for its food and beverage outlets across more than 30 properties every day. This meant checking and updating more than 1,000 unique spreadsheets and manually ensuring that every item is accounted for and properly connected to other related items. While the company was already making this process part of its daily workflow, a key component of Continuous Accounting, the work still required an inordinate amount of costly, manual intervention. Worse, all of those results had to be reviewed, and the accounts had to be reconciled at the end of the month, which required poring over more than 30,000 spreadsheet cells during the close. This critical but labor-intensive process sent the company searching for a better way. It implemented software that automated the matching of transactions from every POS system, so only exceptions (or unmatched transactions) were the focus of the daily routine. Correcting entries could then be made in near real time. As a result, the company is able to reconcile these high-volume accounts every day. This continuous and automated process not only ensures accurate daily balances that can be used for analysis and business-decision support, but it also streamlines the reconciliation of these accounts at month-end. Taking these steps represents a fundamental shift in the way accounting and finance operate. 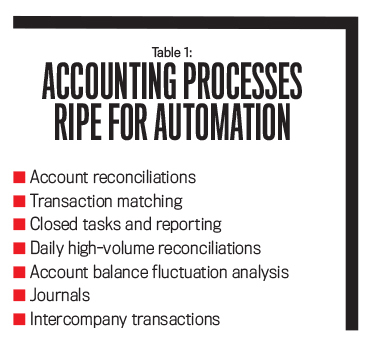 When rote tasks are eliminated with automated processing, accounting and finance can become proactive rather than reactive, and accurate information can be delivered in real time. This frees skilled accountants to move their focus from mundane transactional tasks to analysis of the bigger picture, which drives value for the entire business. By employing Continuous Accounting practices, everyday accountants can become Exceptional Accountants, providing high-value services in areas like fraud detection, compliance, data analytics, technology strategy, and business advice. When the casino automated its manual accounting processes, its accounting and finance team spent fewer hours manually searching for errors, fixed exceptions quickly when they were identified, and saved time by eliminating the need to manually transfer data across disparate systems. Internal controls built into the casino’s software enhanced visibility, improved accuracy, and delivered superior results in far less time. 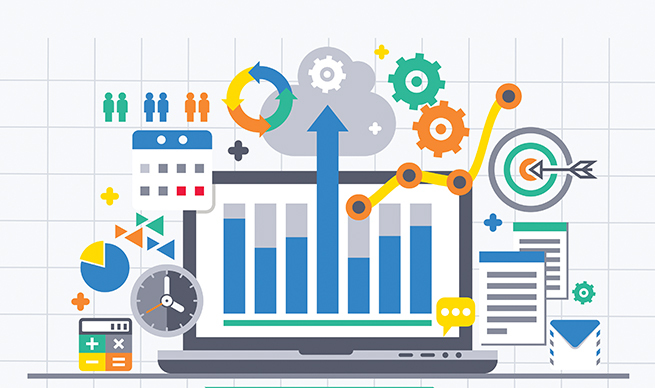 With this workflow in place, accountants could shift their focus to analyzing the data and reports to find issues or identify business trends, benchmarking productivity outcomes, and continually honing internal processes. Accounts that are identified as being of particular importance are monitored throughout the month—and on a daily basis, if needed. This means there’s more time to react to items needing further investigation, an end to rushed period-end reviews, and increased emphasis on the analysis of results for changing business trends. Exceptional Accountants are a company’s experts on its business. Their knowledge and expertise give them the instincts to quickly discern mistakes, compliance issues, and evidence of fraud. Having time for analysis enables them to identify shifting market conditions that impact the bottom line. As they embrace automation, they begin to create the environment of continuous improvement and forward-looking thinking that finance teams need in order to stay engaged and deliver full value. The layered benefits of leveraging technology lead straight to the topic of Robotic Process Automation (RPA). According to the Institute for Robotic Process Automation (IRPA), “Robotic process automation is the application of technology that allows employees in a company to configure computer software or a ‘robot’ to capture and interpret existing applications for processing a transaction, manipulating data, triggering responses and communicating with other digital systems.” Many fear that RPA will mean death to a number of accounting jobs, and they’re partially right, but not in the way you may think. RPA today is largely driven by process automation driven by and executed based on rules. By using business knowledge and human intelligence to update the rules engines on a regular interval, the robots can be taught to continuously improve and hone already automated processes. This is done by extending automated functionality to processes, systems, and data beyond the reach of interfaces to facilitate the integration of disparate financial systems. For example, when an accountant identifies a common thread while analyzing exceptions, a rule can be created to process those items so they are no longer treated as exceptions—as long as finance automation is already in place around that process. The more procedures that are automated within an organization, the greater the opportunities to discover additional areas to automate. RPA-based rules will improve over time. For now, accountants can best utilize the technology by determining the patterns that can lead to a customized rule. 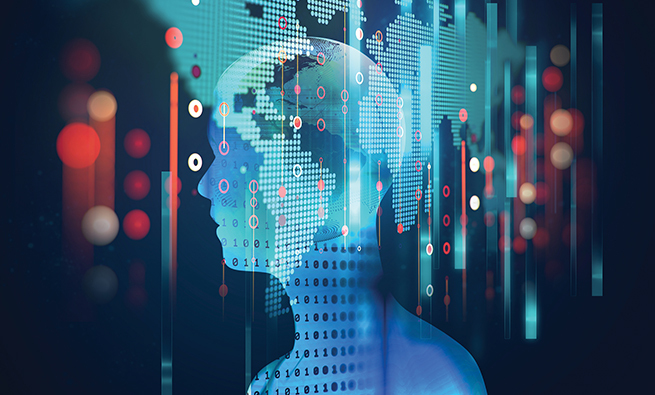 By capturing and processing the data that creates a financial transaction, RPA takes over many of the number-crunching activities performed by accountants. Because machines do things the same way all the time, the numbers add up perfectly, minus the risk of human error. This will result in fewer exceptions over time and more auto-reconciled accounts, cleared items, automatically booked intercompany transactions, and auto-posted journal entries. Thus RPA will reduce work volumes for some traditional accounting tasks. 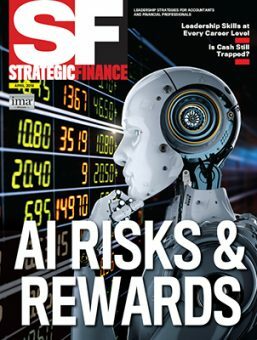 The power of RPA isn’t in replacing people with robots but in releasing them to focus on strategic operations. 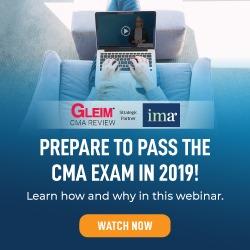 Higher-level accounting is complex, and whether investigating accounting anomalies, evaluating financial reports, or preparing corporate taxes, in-depth know-how and analysis require nuance. RPA strengthens accounting by completing unskilled tasks. It fosters continuous improvement by enabling accountants to use their knowledge to continually enhance the capability of the robots while freeing themselves to be more analytical and forward-looking. It enables skilled individuals to provide strategic services to both their department and the entire organization. Standardize and streamline. Start with the low-hanging fruit. Consider which manual processes not only are risky, but also those you may be able to tweak quickly for instant improvement. Automatically match transaction types. Beware of custom-built solutions that require expensive development; not all transaction-matching tools are created equal. Look for one that can manage high volumes of data while also delivering out-of-the-box flexibility to meet your unique requirements. Continuously validate asset balances. Look to automate most of your reconciliations, not just a few. Make sure automated reconciliation settings can be set at the account level to ensure that your unique rules and controls are sufficiently satisfied. This helps you automate as many reconciliations as possible. Increase visibility and enhance controls. Stop using spreadsheets. They can’t provide the efficiency, control, and visibility needed for modern task management. They weren’t built for it. Connect and integrate with your existing systems. Look to enhance, not replace, your existing systems. Not only will cloud applications be better equipped to complement current investments, but they also help finance and accounting teams own their technology without the need for costly IT intervention. The current levels of turnover in accounting and finance teams are costly and impact business performance and growth. It’s time to reverse those numbers through finance automation. It’s time to elevate the role of finance to establish confidence in your accounting processes and insight into your operations. It’s time to give your accountants the assurance that they matter deeply to the organization. It’s time to free your accountants to become truly exceptional. Susan Parcells, CPA, CGMA, is senior director, finance transformation, and product expert at BlackLine, a provider of financial controls and automation software. She can be reached at susan.parcells@blackline.com. Very informative article, well written. Finance and accounting processes must be digitized and automated because of significant economic effect. For example, one of those processes is collecting recurring payments which can be automated with a direct debit system in order to recover lost revenue from outstanding and failed payments, as well as save precious time. Excellent post. finance automation is every finance person’s dream. automation finance cannot only saves time and money but also reduce errors and improve efficiency. read related blogs at http://www.performancecanvas.com/resources/blog/. Indeed a very useful and handy report. motivates me to start CONsidering some major changes in our company accounting system. This article causes me to wish I were not a ‘fully-depreciated’ (retired) CMA. The article describes the dynamic life of accounting that could be…ought to be! INTERESTED TO KNOW MORE ABOUT RPA AS ONE OF INTEGRATED APPROACHES AND TECHNOLOGIES THAT IS BEING USED TO AUTOMATE ACCOUNTING PROCESSES. IT IS QUITE CHALLENGING APPROACH WHEN IT HAS TO DEAL WITH DIFFERENT PLATFORMS SEAMLESSLY. I WISH IF SUSAN CAN CLARIFY THE UNDERLYING POTENTIAL CHALLENGES AND DISCUSS THE WINNING STRATEGIES TO MITIGATE THEM. Great article. Makes a lot of sense. Although I would think that most accountants will not become exceptional accountants, and they will not be required in the future.